The Ringed Teal is native to Paraguay, Uruguay, northern Argentina and southern Brazil, it is a small teal that is very easy to maintain in captivity on a basic waterfowl diet. When it was first available to aviculture it was considered delicate and only suitable for maintaining in a tropical house. Over many successive generations the Ringed Teal has adapted to Captivity and become very hardy and can easily withstand a UK winter with no requirement for additional protection provided some open water can be maintained. The Ringed Teal is not believed to be threatened in the wild and is one of the more common waterfowl in captivity. As with many other southern hemisphere waterfowl the Ringed Teal does not have an eclipse (non breeding) plumage so the striking colours of the males plumage are maintained throughout the year once adult plumage is assumed at about fourteen weeks of age. Due to their small size Ringed Teal can be easily predated and this perhaps makes them particularly suitable for keeping in an aviary where a higher degree of protection can be provided. If being kept in an aviary they can also be maintained full winged and they can then be seen perching or flying up to elevated nest boxes that adds yet more interest. They readily become very tame and are a delightful duck to keep. Ringed Teal can usually be expected to breed in their first year and as with other species that originate from sub-tropical regions they can have a very extended breeding season. They can lay from March through to September so a number of clutches can be anticipated in a season if the eggs are taken for artificial incubation. They nest in hollow trees in the wild and consequently require nest boxes in captivity and while they prefer a box raised off the ground this is by no means essential. While they are relatively easy to breed it is not always straight forward to get the first clutch but once this has been achieved they will usually continue to lay many clutches in a season. The pair actively work together looking for a suitable nest site and it does pay to have a number of potential sites for them to investigate, this helps to stimulate the breeding process and the laying of the first egg, once this has been achieved almost nothing will stop them from laying. If they are seen investigating potential nest boxes but do not actually lay it may be sensible to either add one or two additional nest boxes or slightly change the positions of the available nest boxes that may help trigger the laying of the first egg. Once established the Ringed Teal have a very strong pair bond and will never be seen far apart and consequently hybrids with other species are uncommon. The clutch size can vary significantly from eight to fourteen eggs, ten to twelve being very normal, the highly glossed pure white eggs take 26 days to incubate and the ducklings are adorable from the outset, they are invariably steady and very easy to rear on duck or poultry starter crumbs. They grow rapidly and the females can easily be distinguished in their first plumage having the distinctive white eye stripe that remains with them into adult plumage. There are at least three colour variations of the Ringed Teal being Blonde, Orange and Blue, the blue is very much rarer than the orange. The colour mutations are nearly as easy to keep and bread as the normals. The Blonde mutation is not particularly impressive being a dilute of the normal and is not nearly as popular as the Orange and Blue forms. The Orange and Blue forms show considerable variation in the colour intensity that provides added interest to observe as a cutch of young mature. The Blue and Orange colour forms would appear to be totally distinct mutations because if you breed from a blue and an orange all the young appear normal in colour. Adult trio Blue Ringed Teal . Young Blue Ringed Teal are usually available at £75 per pair. Blue female and young. In an aviary Ringed Teal can very successfully be left to parent rear as in this case. Juvanile Orange Ringed Teal approx. 5 weeks old. 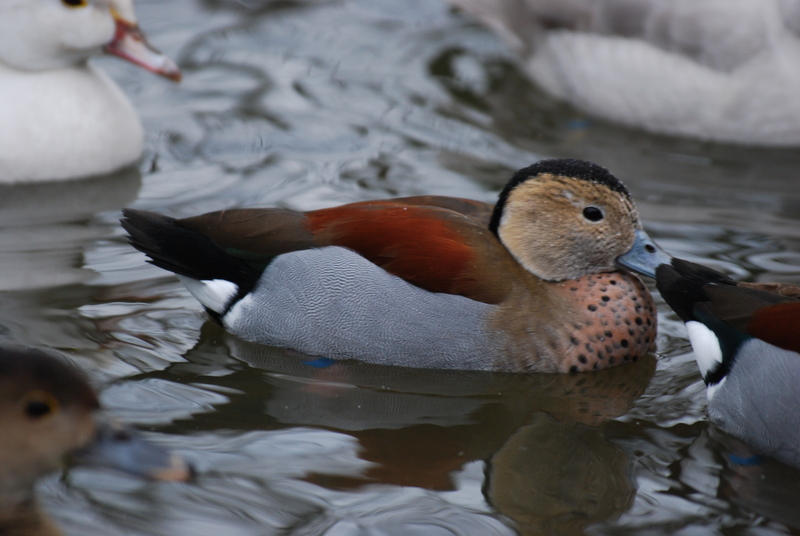 Orange Ringed Teal have a long breeding season and young are usually available at £75 per pair.